The first person narrative is told through the eyes of Maria, an only child whose father is currently married to a woman who is not her mother, a situation which necessitates their living by the seaside with relatives while he extracts himself from the unwanted first marriage. Her mother’s relationship is little more than a footnote to the plot, as most young teens are more absorbed in their own affairs than that of adults. Maria’s fraught relationship with her cousin Tsugumi occupies the majority of the story. Tsugumi is a frail young woman, born with many ailments and not expected to live a long or healthy life. She is doted on by her parents and sister, who she is constantly cruel to. Tsugumi is not a character who wants or deserves your pity. She is malicious and rude, she takes advantage of others and manipulates without remorse. And yet there is something that Maria, and my extension readers, are drawn to about her. It’s impossible to look away from her, and the powder keg that could explode at any time. Overall I enjoyed this book, but I think the sparse style and very slow moving plot might be off-putting for readers who are looking for fast pace or conflicts to be resolved. 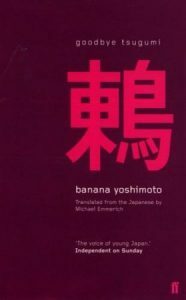 It’s my second book by Yoshimoto and I will definitely be looking for more of her work.